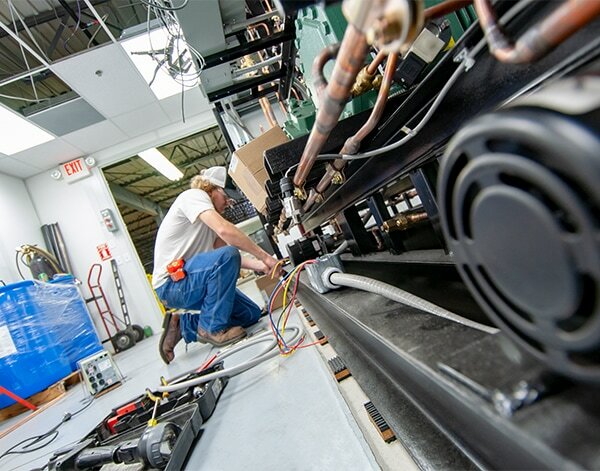 Refrigeration Efficiency and Saving Money | Zero Zone, Inc. Saving Money This Year on Refrigeration – Zero Zone, Inc. When making your New Year’s resolution, you possibly resolved to save more and spend less. How can retailers like you continue to save money in 2019? Every grocery store requires thousands of kilowatt-hours (kWh) of electricity per year to operate. This electricity covers refrigeration, ventilation, lighting, cooking, heating and cooling, and office. But the overwhelming majority of electricity goes to refrigeration equipment that runs whether the store is open or not. This makes refrigeration an obvious target for energy and cost savings. Through some simple investigation and adjustments, you could benefit from energy savings. Check out some steps our product managers and engineering team recommend to get the most out of your commercial refrigeration equipment. First, collect data about the energy that your refrigeration equipment uses by referring to the component specification sheets. You should verify that the equipment is operating at the specified temperatures. If not, the controls could be set too cold, which wastes energy, or there could be a performance issue such as an iced coil or low refrigerant charge. If you notice equipment is not operating correctly, contact your refrigeration contractor. You can also contact your utility company. Ask if they can perform an energy audit to compare your energy usage to similar businesses that use refrigeration equipment. They may even suggest ways to improve the efficiency of your equipment. In addition to checking your refrigeration equipment, look at your HVAC system settings. Refrigerated display cases are designed to operate in ambient temperatures of 75°F and 55% relative humidity (defined by ASHRAE). Ensuring that your HVAC equipment maintains good store conditions will reduce refrigeration equipment energy consumption, and it is more cost effective to have the HVAC equipment cooling the store instead of having the display cases dehumidifying it. There are many features available that are designed to reduce energy usage and provide cost savings down the road. Motion sensors, which turn display case lights off when no shoppers are around, have a relatively quick payoff. Anti-fog coating is a clear film on doors that prevents fog buildup and helps shoppers see products. Over time, this leads to energy savings because the case does not get opened unnecessarily, which means less energy is consumed to cool the case. Most display cases come with standard anti-sweat heaters that limit door sweating in humid conditions, but they can run too aggressively in cooler, drier stores. Consider ordering your next display case with an anti-sweat controller, which cycles the heaters off when there is less humidity in the air, thereby saving energy. Also contact your refrigeration manufacturer. They may be able to offer other features to reduce energy consumption. It pays to be proactive and schedule regular maintenance for your refrigeration equipment. Instead of waiting for an issue to happen, you should schedule regular visits from your refrigeration contractor to keep the equipment running efficiently and catch component failures early. General cleaning and maintenance is important for efficient case operation. You should clean doors and windowed ends so people can see product. Regularly clean lint and dust accumulation off of condenser coils and discharge air grills. On a monthly basis, ensure gaskets are not torn, doors are at ideal tension, and all fans are operating. To check gaskets, simply place a dollar bill in the door track. If the dollar slides out with little to no resistance, it’s time to have the seals replaced or adjusted. To check ideal door tension, open the door and observe how well it closes. A properly tensioned door will close itself gently and not swing open. If the door does not close or swings open, the case will not operate optimally. There are two ways to check fan operation. One way is to put your hand near the discharge air grills. If all fans are working, the airflow will be the same from door to door. If less air is coming out, a fan may not be working. However, the most effective way to check fan operation is to unload product, take out the cover, and visually confirm that the fan is working. Do not put your hand into the fan, even if it appears to not be operating. With so many steps available for reducing your refrigeration energy consumption, it is wise to develop a plan. Even if the budget does not allow for a full equipment overhaul, you may be able to update your cases department-by-department. That allows you to stay within budget, and your New Year’s resolution will be off to a good start!